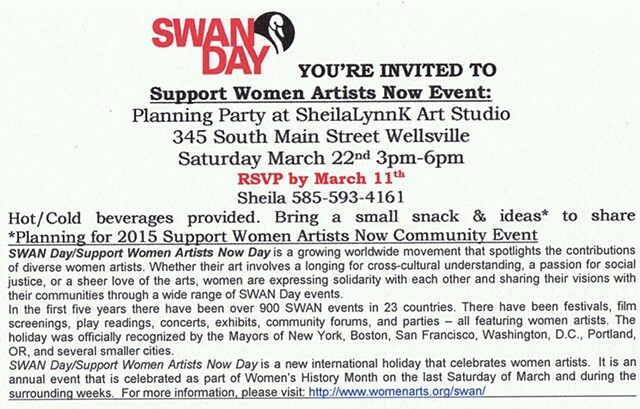 SWAN Day/Support Women Artists Now Day is a growing worldwide movement that spotlights the contributions of diverse women artists. Whether their art involves a longing for cross-cultural understanding, a passion for social justice, or a sheer love of the arts, women are expressing solidarity with each other and sharing their visions with their communities through a wide range of SWAN Day events. In the first five years there have been over 900 SWAN events in 23 countries. There have been festivals, film screenings, play readings, concerts, exhibits, community forums, and parties – all featuring women artists. The holiday was officially recognized by the Mayors of New York, Boston, San Francisco, Washington, D.C., Portland, OR, and several smaller cities.